When you take an express bus to KL, you can avoid botheration of commuting between the airport and your hotel in Singapore or Kuala Lumpur. You also save money that you can use for shopping or for staying an extra night stay at your favorite hotel in the city. If you were traveling Singapore to Malacca or Genting Highlands, you can save a lot of money as the bus fare us quite cheap as compared to air travel. You will have the luxury of taking an express bus to Malaysia. It would not only save you money, but also give you the convenience of arriving directly in the center of city’s hotels and shopping belt without botheration of airport transfer. It is quite cheap to take the bus from Singapore to Kuala Lumpur rather than taking the low budget flights from Singapore. The bus fare for a one side of traveling starts from SGD23 and you will reach directly in the Kuala Lumpur city centre. If you want to experience luxury at its best you should choose to travel on an 18-seater luxury Singapore-KL coach that will cost you around SGD56. You also get a choice of traveling in three classes. The first is the economy, then the executive and the top-most luxury VIP and Super VIP. Those who are comfortable with economy class bus service can travel in the standard express bus having a capacity of up to 40 passengers. In the same manner in the executive or VIP class, the numbers of seats are only 25. If you still want more spacious seating then you can take the 20-seater or lesser seats on a single-deck bus. It has more leg room and elbow space. 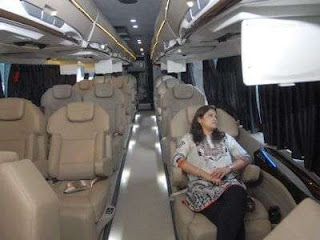 In this luxury bus service you can also work on your laptop and be connected throughout the journey. The plug points provided in the luxury bus service lets you use your laptop all through the journey. These are the main reasons that people prefer to take bus instead of flight from Singapore to Kuala Lumpur.